Once chatbots entered the customer support model, it was never the same. With support automation customers are not left on the line and businesses are accessible 24/7 to answer queries without exhausting the human support team. By the year 2022 the majority of customer queries are predicted to be answered by a bot. The growing list of customer support use cases is seemingly endless, but we’ve managed to compile the best of the benefits and use cases to make you a bot believer. With each year immediacy continues to solidify itself as a pillar of our society. So it should come as no surprise that automation is truly coming all around us. From checking in at the airport, making travel arrangements, ordering food or booking an appointment, automation is at play. But the crowning jewel of it all is customer support. With the advancements in AI, chatbots are no longer rudimentary and one dimensional. They have the ability and knowledge to complete complex tasks and resolve a vast range of customer queries. Customers prefer the ability to quickly and efficiently receive answers to their queries without being put on hold and relying on a live team. With the continuous improvement of bots, companies are expected to incorporate AI into their business model in the immediate future, if they haven’t already. Customer support was impossible to scale until now! This is no longer the case. 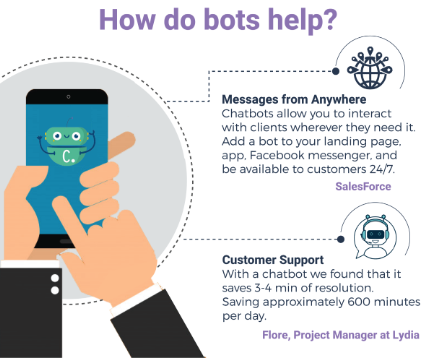 Bots can answer automatically up to 80% of customer support requests. Of course, when necessary the chatbot can pass the user on to support agent. And as the data collected from the conversation with the bot will be readily available to the agent, the ticket will be resolved quickly. AI laden chatbots are virtual assistants that help your customers but also helps you understand them. Bots are continuously learning by collecting data and in turn, uses the data to better understand your customers. Creating a more personalized experience for your users and delivering answers to questions before they’ve been asked. Anticipating customer queries before they do will give companies a steep advantage. Use this to retain your customer base and greatly reduce the rate of abandonment by improving overall customer satisfaction. 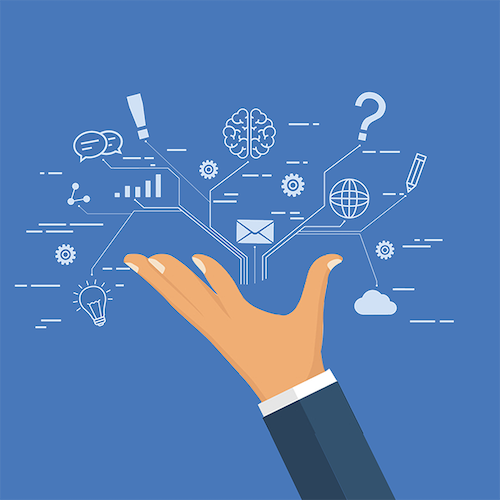 Systems with AI embedded can monitor a nearly infinite amount of website and in-app activity for distress indicators, identifying customers experiencing issues and what those issues are. By using AI to your advantage you can observe your sites overall activity for potential stressors or areas where customers are experiencing issues and improve them. Your human team is vital to your support operations. However, hiring and training agents absorb time and generate costs. It costs $4,000 or more to hire a call center agent and an additional $4,800 or more to train him or her. The more agents, the more costs which makes it very hard to scale support operations. 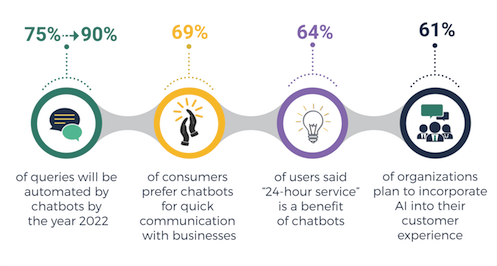 Although a chatbot needs to be monitored continuously, it can have an unlimited amount of conversations at the same time. Here’s your scale. Free up your support team to focus on high-level requests whilst your bot deals with the rest. This approach reduces turnover by providing agents with all they need to be successful which is a win on both ends. Chatbots come in handy when companies have updates or changes to their offerings. A simple change to the scenario and the message will be implemented and coherently applied to all conversations. Be accessible to your clients worldwide all day, every day. Chatbots don’t adhere to precious things like weekends and public holidays. This allows companies to consistently provide customer service to anyone who needs it, regardless of date and time. This fact alone can impact your customer satisfaction rating for the better. Positioning yourself as focused on customer support will increase the value of your brand, customer satisfaction also impacts loyalty and decreases customer abandonment. AI technology provides reliable service and is never late or out to lunch. 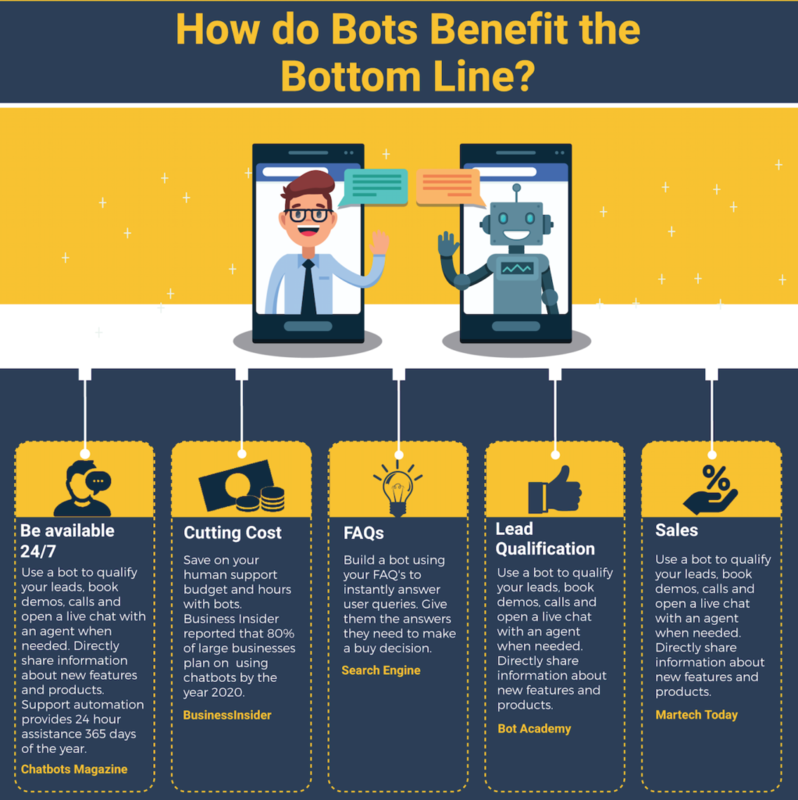 With a bot, there is no risk of your team getting angry, overworked and negatively affecting your customer interactions. Content customers and positive interactions lead to repeat business. A recent Zendesk study showed that 42% of B2C customers purchased more after a good customer service experience, whilst 52% stopped buying after one bad customer service interaction. Queries can still be escalated to the appropriate agent when needed but this handoff is one time opposed to being passed to several representatives which we are all too familiar with. But when this handoff is necessary the agent will have all the information needed thanks to the previous interaction with the bot. Agents, along with a customer-service virtual assistant, can now provide reliable service to your clients, anytime and anywhere. In our digital society we are accustomed to finding what we need within seconds, so why should interactions with companies be any different? We have already surpassed writing letters to customer service teams and visiting an establishment altogether. We can now write emails or make a phone call to address our queries. The next step for speed an efficacy is a chatbot. 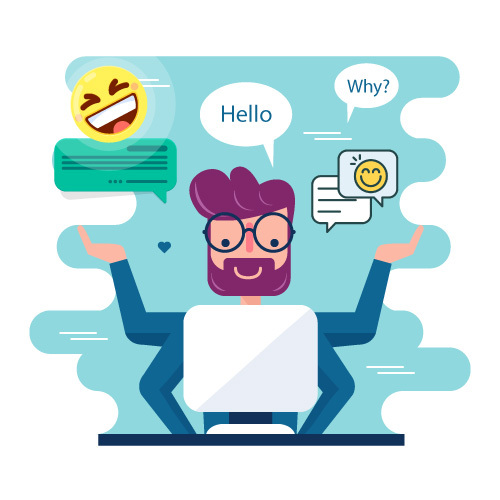 Once a virtual assistant is implemented on a company website their users won’t have to comb through all the information on their site but simply ask the bot and receive their answer instantly. Bots have the knowledge immediately at their disposal without the need to research or ask around. Leaving customers with rapid, accurate and consistent responses to first level queries. Using a bot as your first line of defense also positively effects the live team. No longer do they have to respond to the same low-level requests like FAQ’s. Using a bot helps to equip the live team with the data they need to problem solve in real time, and faster than ever. Our society is moving away from human interaction and we now gravitate towards self-service options for customer service. This is particularly true for the millennial generation. A recent study stated that 72% of millennials believe a phone call is not the best way to resolve their customer service queries. 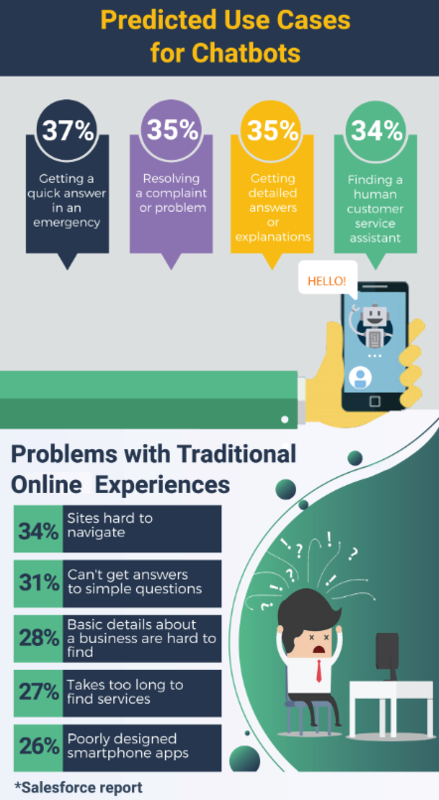 The following generations can be expected to be even more reliant on self-service and quick answers which can be resolved with the implementation of a chatbot. Choosing not to change and adhere to the needs of future generations can severely impact your brand and in turn the bottom line. Bots collect customer data to provide a personalized customer service experience. Whether it is access to previous orders or page visits the bot can get a feel for the user’s tastes and personality and recommend products accordingly. Further down the line websites can and will be able to be rearranged on demand to suit the tastes of the user. Tailoring the user experience will maximize customer retention and encourage repeat business. This data also helps the live team to understand the customers on a deeper level. Scale your customer support operations with intelligent bots. Use the power of AI through a bot and learn about your customers with each interaction without having to wait for a census. The Clustaar platform is available in 5 different languages with more available upon request. Get started on your chatbot solution today with the help of our team of experts. Book a demo today!